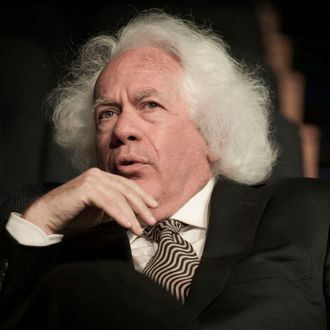 The New Republic’s onetime, longtime literary editor, Leon Wieseltier, wants to run a learned journal again, according to multiple sources in TNR’s orbit. Despite what happened last time with Facebook’s Chris Hughes, Wieseltier is throwing his high-minded lot in with another tech-money billionaire: Laurene Powell Jobs, widow of the late Steve Jobs. But the as-yet-unnamed journal, which among other things will seek to discuss the effects of technology on our lives and think critically about it, will not be a reboot of The New Republic, despite rumors that he was going to buy the old place back, and maybe publish many more of those essays picking apart internet triumphalism or crusading to break up Amazon. The restlessly Gchatty TNR alumni network — and most of them are alumni, since they, like Wieseltier, walked out after Hughes fired editor Franklin Foer in 2014 — has been trying to convince itself this was happening ever since, ten days ago, Hughes, 32, officially gave up on his $20 million, four-year experiment of trying to turn the century-old magazine into something “vertically integrated” and announced he was putting it up for sale. So why not Laurene Powell Jobs, whose net worth is estimated by Forbes to be $16.9 billion? She and Wieseltier (who, truth be told, seems to know everyone) are friends. For all her wealth, she’s mostly been behind the scenes, concentrating her philanthropy in education projects (she is the founder and chair of the Emerson Collective, “an organization that uses entrepreneurship to advance social reform and assist under-resourced students” and co-founded the College Track, which “helps disadvantaged students prepare for and graduate from college”). She’s also been a big supporter of the Ready for Hillary super-pac, and she did her best to get the Aaron Sorkin film Steve Jobs killed, reportedly calling studio heads and both Leonardo DiCaprio and Christian Bale to ask them not to do the movie. But something is definitely afoot with Jobs: Wieseltier has been talking to editors at other elevated literary journals about joining his new venture. But it won’t be a new, old New Republic — even if Hughes was interested in selling it to him. “I can’t imagine a more distressed asset,” he says. Hughes “vandalized it. He sacked it.” And he has no plans for restoration.